Imperial County, along with San Diego County, comprises California’s Southern Border Region but their similarities pretty much end there. Whereas the presidio at San Diego was established by the Spanish in 1769 and is the oldest European settlement in the state. On the other hand, Imperial County, created in 1907, is California’s newest. Whereas San Diego County is the second most populous county in California, Imperial County is the least. San Diego’s climate is characterized as chaparral, Imperial County is located within the Colorado Desert. But yes, both counties lie just north of the Estado Libre y Soberano de Baja California. 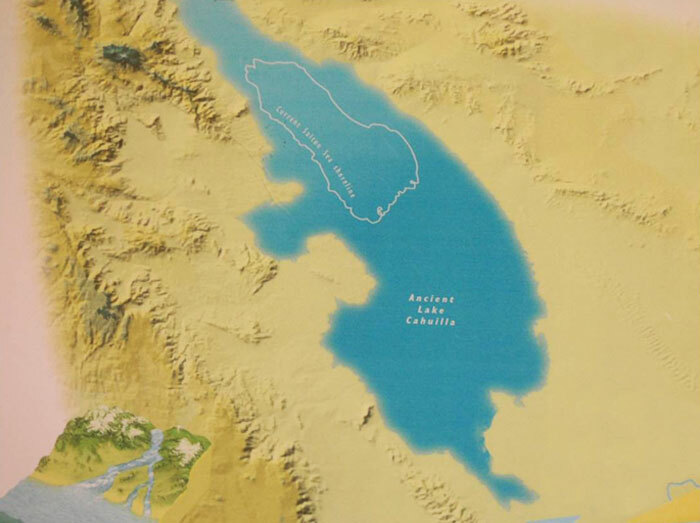 A map from the Salton Sea History Museum showing the size and location of Lake Cahuilla and the Salton Sea. Before the Spanish Conquest the Colorado Desert was home to the Iviatim and Kumeyaay peoples, who emerged as distinct cultures around 7000 BCE from earlier Uto-Aztecan language-speaking peoples who archaeological evidence suggests arrived along the shores of the prehistoric Lake Cahuilla some 12,000 years ago. There is some evidence that the area may’ve been what the Mexica referred to as Aztlán. There are disagreements about the etymology of the Nahuatl place name but most interpretations are along the lines of “home of the snowy egrets,” or the “place of whiteness” which is in turn often interpreted as a reference to Lake Cahuilla and its descendant, the Salton Sea, being important resting and nesting areafor the migratory birds of the the Pacific Flyway. The first Spaniard to arrive in the area was Melchor Díaz, who came in 1540 in search of the fabled Seven Cities of Gold. The conquistadors were disappointed to discover the humble Zuni-Cibola Complex in present day New Mexico) and returned to New Spain. In 1821, after elevent years of revolution, Mexico achieved independence from Spain. In 1846, the US invaded Mexico and two years later, ceded 1.37 million square kilometers of its territory to the US including Alta California and what’s now Imperial County. The creation of the Salton Sea. California became the US’s 31st state in 1850 and at the time, modern Imperial County was part of San Diego County. 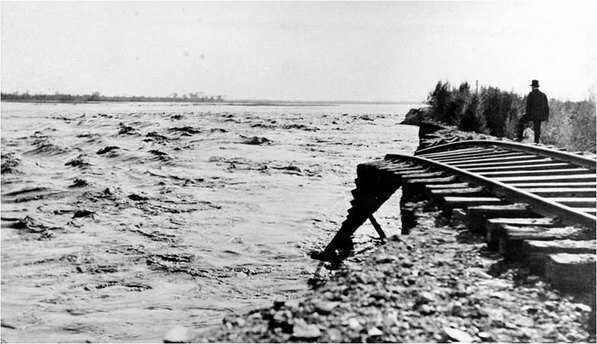 Most of the remote inland settlements in the county were quite small when in 1905, torrential rains caused the Colorado River and irrigation canals to flood, creating in the process California’s largest lake, the Salton Sea in the same depression that had once been the site of Lake Cahuilla. 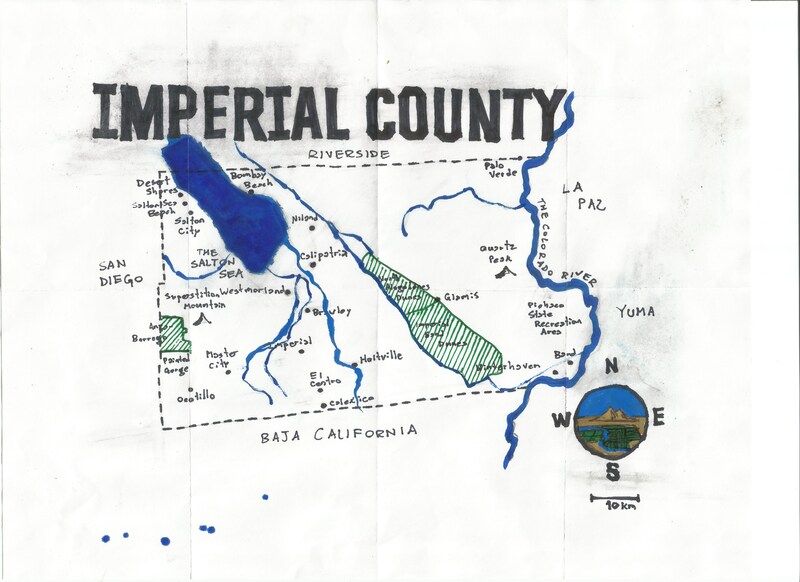 Imperial County was carved from San Diego County in 1907. Although mostly desert, the economy of Imperial Valley is dominated by agriculture. Thanks to those aforementioned irrigation canals, the desert blooms with alfalfa, carrots, lettuce, and sugar beets. 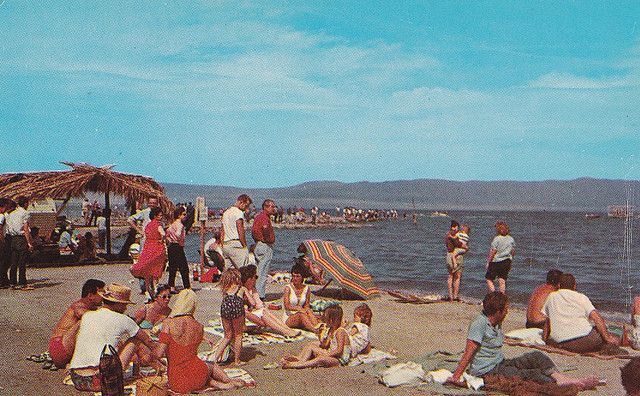 Tourism was once a primary draw to the region, thanks to the Salton Sea. However, as it evaporates in the desert heat, its salinity increases making it less hospitable to live both within its waters an along its shores. The old resort towns along its coast have long been abandoned by crowds of vacationing Angelenos. Filling their void are much smaller numbers of people who in many cases choose the Imperial Valley as a place to take a longer sort of vacation, an exile perhaps, from mainstream society. 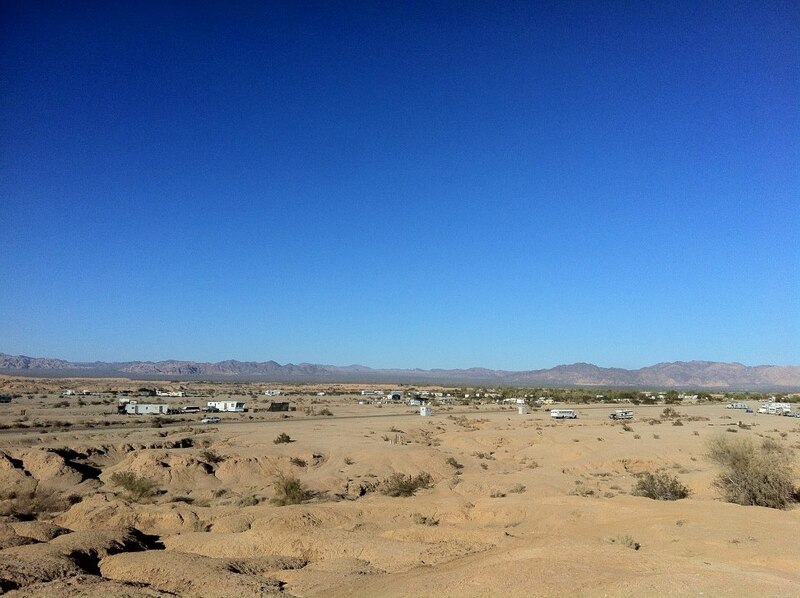 In the Imperial Valley one can get a taste of life off the grid. There is folk art like Salvation Mountain, East Jesus, Driftwood Charley’s World of Lost Art, and the Wheels of Karma and War; there are historical sites like Fort Yuma; and there are natural attractions like the Algodones Sand Dunes (the largest dune field in the US), Anza-Borrego Desert State Park (the largest state park in California), portions of the Cibola National Wildlife Refuge, a stretch of the Colorado River, Fossil Canyon and Painted Gorge, a portion of the Imperial National Wildlife Refuge, and the natural-but-unnatural Sonny Bono Salton Sea National Wildlife Refuge. It’s a weird and wonderful place and I’ve only just scratched its sun-baked surface. If there is sufficient interest in reading about my explorations, I’ll head out to any corner and share what I find. Here’s a poll, in which you can vote for as many places as you’d like — and a primer to whet your appetite and inform your votes! Andrade is a small, unincorporated community located on the Fort Yuma Indian Reservation. It was originally known as Cantu, named after Col. Esteban Cantu. It was renamed in 1912 after the establishment of a post office. As of 2010 it had a population of 59, 100% of whom identified as Latino. Andrade is also home to Driftwood Charley’s World of Lost Art. Bard is an unincorporated community named after booster Thomas R. Bard. It’s first post office opened in 1910. 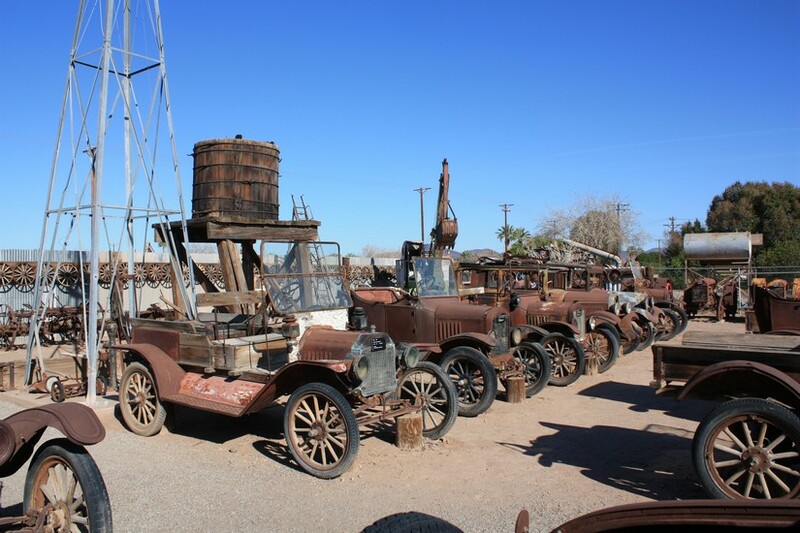 It’s also home to The Cloud Museum, a large collection of old, rusting, cars. Bombay Beach is a CDP on the Salton shore which in 2010 reported a population of 295. I’ve enjoyed a few beers at its famous Ski Inn, a popular filming location also visited by Huell Howser, Anthony Bourdain, and The Mentalist. In 2010, Brawley reported of 24,953. A cow town, it annually hosts the Cattle Call Rodeo. It was originally named Braly, after landowner J.H. Braly. Attractions include an octagonal Post Office and the Belvedere Theatre (now the Brawley Playhouse Theatre). Calixeco is a portmanteau of California and Mexico located across the border from another portmanteau town, Mexicali, Mexico. In 2010 Calexico reported a population of 38,572. 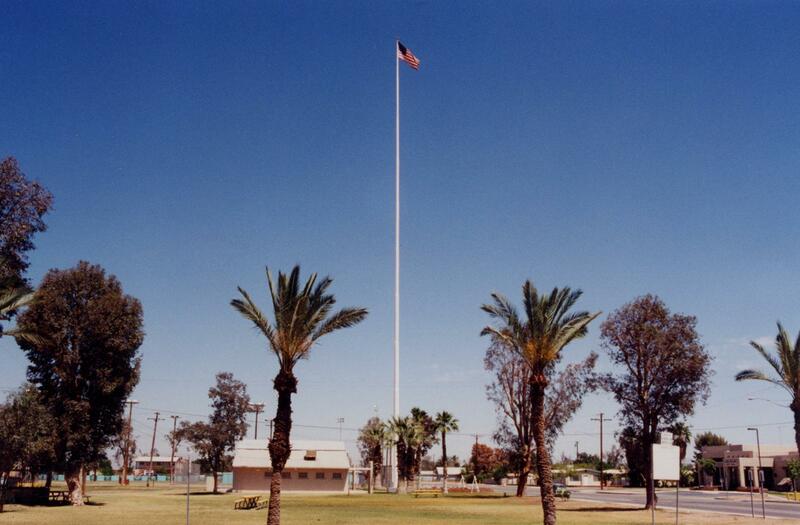 Calexico began as an Imperial Land Company tent city in 1899. 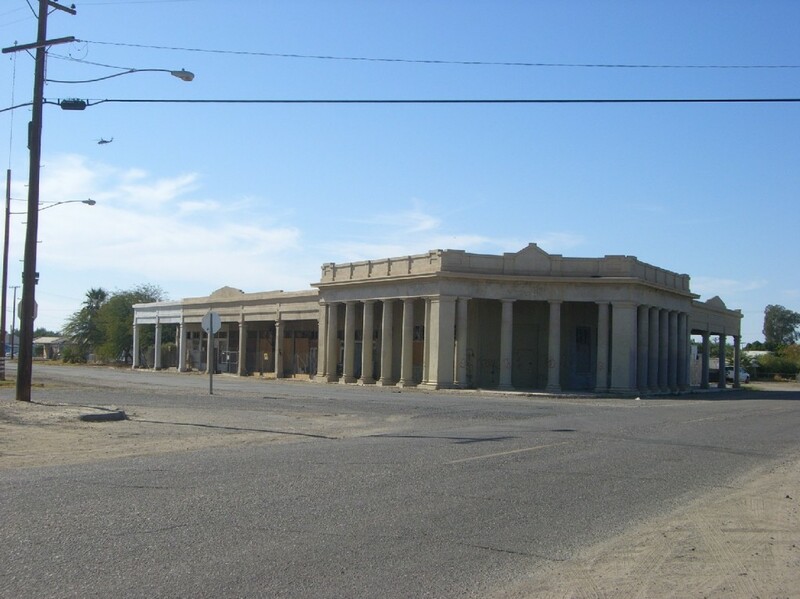 The first post office in Calexico opened in 1902 and it incorporated as a city in 1908. Every May Calexico hosts Fiesta Popular | Calexico Mariachi Festival. Calipatria is a city which in 2010 reported a population of 7,710, 4,000 of whom are inmates at Calipatria State Prison. 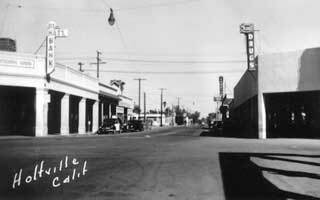 The town was founded by the Imperial Valley Farm Lands Association as Date City in 1914 but was renamed Calipatria and incorporated in 1919. Located 55 meters below sea level, Calipatria lies at the lowest elevation of any city in the Americas. It also boasts of having the “World’s Tallest Flagpole” (even though the 56-meter-high Calipatria Flagpole is dwarfed by the 165-meter tall Dushanbe Flagpole in Tajikistan). El Centro is the county seat and largest city, reporting a population of 43,598 in 2010. It is also the largest city in US lying beneath sea level, in El Centro’s case, -12 meters. It was founded as Cabarker, named after landowner C.A. Barker. The first post office opened and it was incorporated in 1908. Its population is about 82% Latino and although located in the desert, is primarily oriented around agriculture made possible by water diverted from the Colorado River. Desert Shores (formerly Fish Springs) is a CDP located at the western shore of the Salton Sea which in 2010 reported a population of 1,104. Felicity was founded in 1986 by parachutist Jacques-André Istel and his wife Felicia Lee. 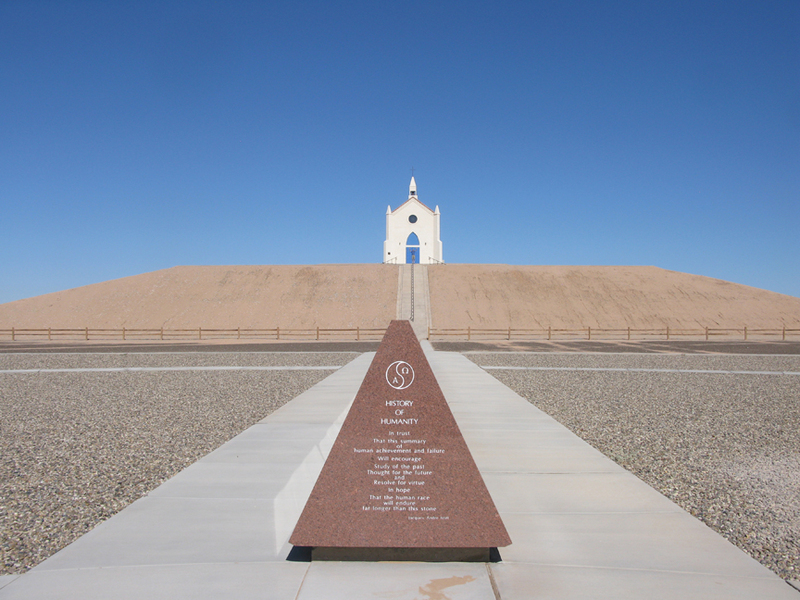 In 1985 Istel published the book, Coe: The Good Dragon at the Center of the World and soon after erected a pyramid to mark the exact spot of the world’s center, Felicity, California. The Fort Yuma Indian Reservation was established in 1884 and lies mostly within Imperial County but partly in Yuma County, Arizona. The Yuma Indians’ mononym is Quechan (or in the Quechan language, “Kwtsaan“). As of the 2000 census, there were 2,376 living on the reservation, 56.8% of whom identified as being solely Native American, and 27% of whom identified as white. Glamis is an unincorporated community originally developed as a Southern Pacific railroad stop around 1886, when the first post office opened. Today it is home to the Glamis Store and Boardmanville Trading Post. c is a CDP which in 2010 reported a population of 4,275. Heber was founded by the Imperial Land Company in 1903 and named after the president of the California Development Company, A.H. Heber. The first post office opened in 1904, after it was transferred from Bradtmoore. Holtville is a city which in 2010 reported a population of 5,939. It was founded by German-Swiss in the 1880s and was founded in 1903 as Holton by W.F. Holt. It was incorporated in 1908 at which time its name was changed to avoid confusion with Colton. A contract killing of a Holtville resident by his wife in 1974 was chronicled in Milton J. Silverman‘s book, Open and Shut. Today, Holtville hosts an annual carrot festival. Imperial is a city which in 2010 reported a population of 14,758. Imperial was created by the Imperial Land Company and the first post office opened in 1901. 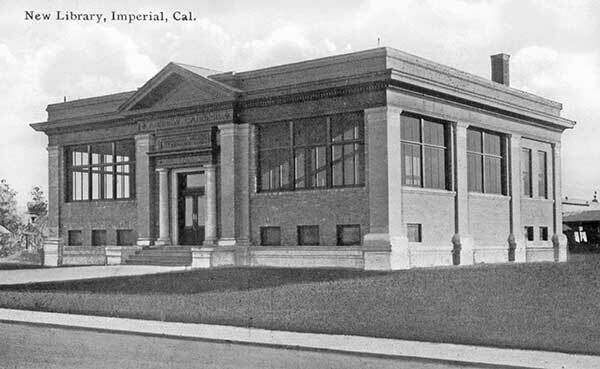 Imperial incorporated in 1904. The town hosts the annual California Mid-Winter Fair & Fiesta in February (formerly the Imperial County Fair). 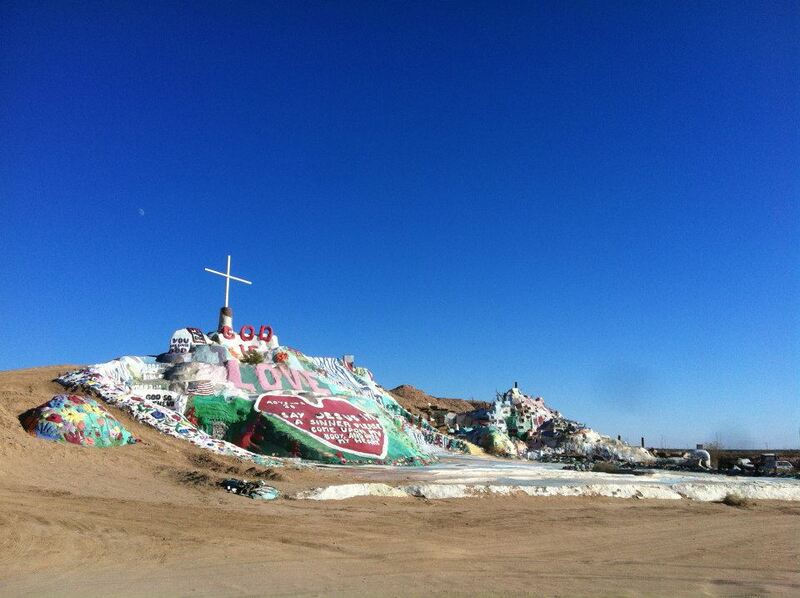 Niland is a CDP which in 2010 reported a population of 1,006. It was first developed as Old Beach, the name of the post office which served the settlement from 1905-1907. In 1910 the post office reopened as Imperial Junction. Its name was changed in honor of Richard H. Hobgood to Hobogood in 1913. It was renamed Niland in 1914 by the Imperial Farm Lands Association. It’s home to a few eateries: Ballesteros Restaurant, Bobby D’s Pizza Plus, Buckshot Deli & Diner, I V Restaurant, Orsino’s #1 — as well as the Niland Inn and a service station. Ocotillo is a CDP which in 2010 reported a population of 266 and was originally developed as a retirement community. 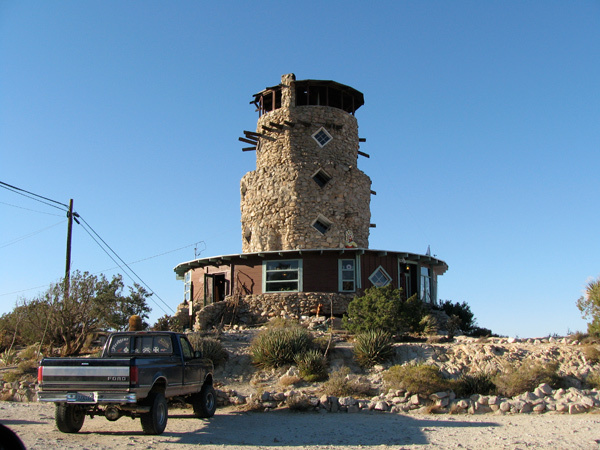 Today it is home to the Old Highway Cafe, the Lazy Lizard Saloon, Red Feather Off-Road Market & Cafe, the Imperial Valley Desert Museum, and Bert Vaughn‘s 20-meter tall piece of 1920s folk architecture, the Anza Borrego Desert View Tower. Oglesby was founded by the Southern Pacific Railroad in 1877. It was named after E.R. Ogilby, and although I don’t have the information, I have to wonder if it was renamed Ogilby after someone caught the spelling error. It was abandoned by 1961 and one of the few reminders of the town’s existence is a cemetery. Not to be confused with Palos Verdes, a town with which it presumably has little in common, Palo Verde is a small CDP located in the Palo Verde Valley. 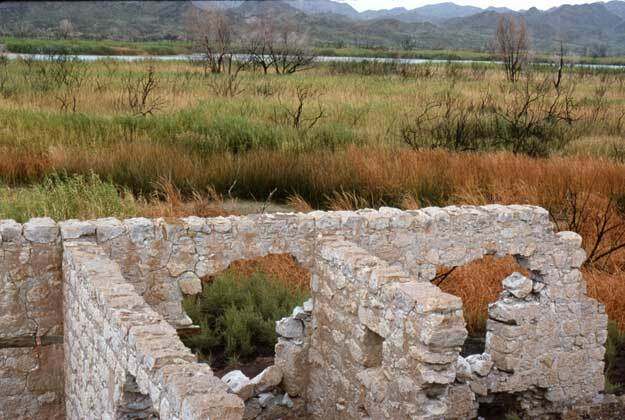 It was formerly known as “Paloverde” but its name was changed to “Palo Verde” in 1905. 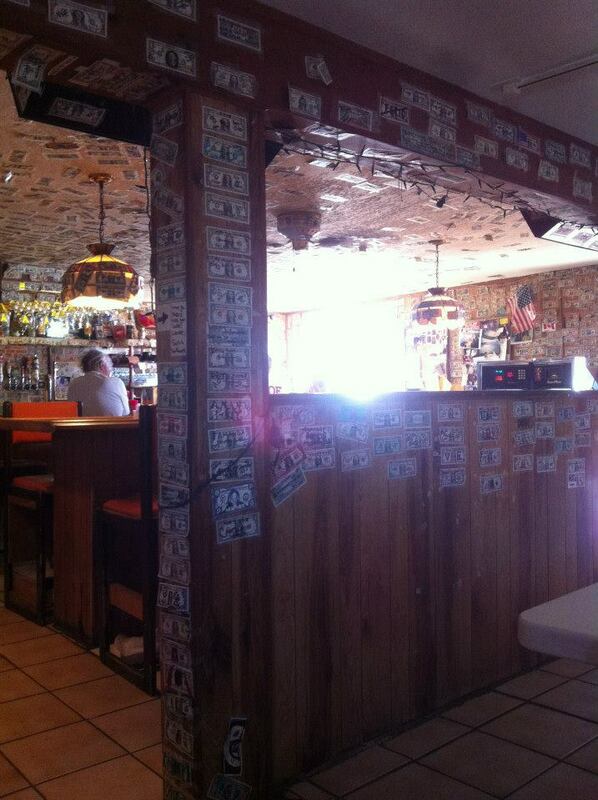 It’s home to Lagoon Saloon & Lodge, Wheelies, and the Palo Verde County Park. Picacho is an unincorporated community. Not only is it a ghost town, but an underwater one, lying beneath Imperial Reservoir. There are, however, some of the ore mills located above the lake level. The ore mills were built to process gold, which was discovered by Jose Maria Mendivil in the early 1860s and who founded the town as Rio. 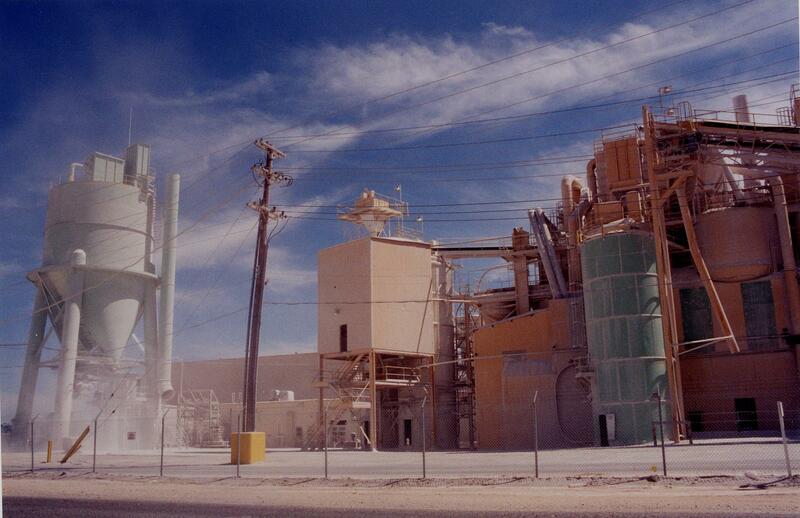 Plaster City is an unincorporated community owned by United States Gypsum, which operates a large gypsum quarry and plant there. It is noteworthy for being the site of the last industrial narrow gauge railroad in the US. Salton City is a CDP which in 2010 reported a population of 3,763, making it the metropolis of Imperial County’s Salton coast. It was developed in the 1950s by M. Penn Phillips and the Holly Sugar Corporation as a resort and although it includes many surveyed streets, most remains undeveloped or abandoned. That’s not to suggest that it’s a complete ghost town, though, as it’s home to a few establishments (e.g. 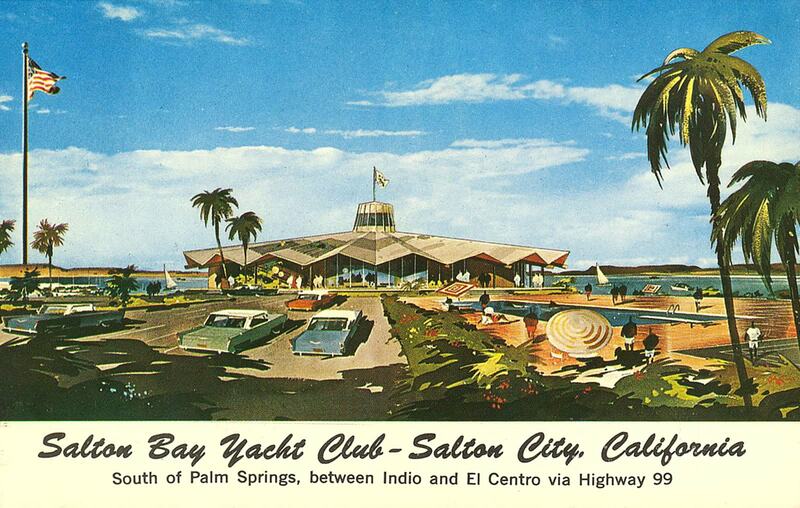 Capt’n Jim’s, Portobello’s, and Ray & Carol’s Motel by the Sea) and an Arco gas station with a map depicting Lake Cahuilla and the Salton Sea in different periods of history. 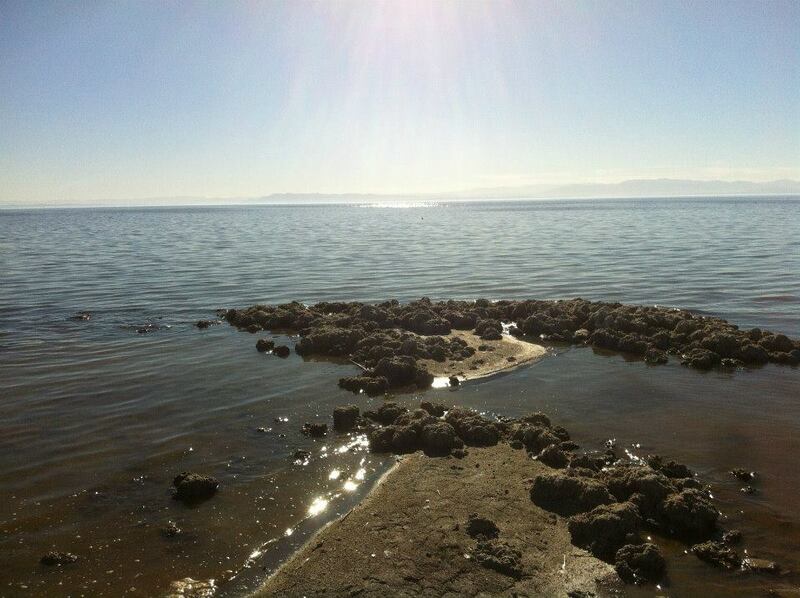 Salton Sea Beach is a CDP located on the banks of the Salton Sea which in 392 reported a population of 422. From 1942 to 1946 it was home to the Salton Sea Naval Auxiliary Air Station. Seeley is a CDP which in 2010 reported a population of 1,739. It is named after developer Henry Seeley. It’s home to Taqueria La Pasadita and The Real Seelee Club. Slab City is a famous squatters’ camp built on the site of Camp Dunlap, an abandoned World War II marine barracks which were dismantled in 1956. The camp has no electricity, no running water, no sewers nor toilets, and no trash pickup service but many Slabbers choose to live “off-the-grid.” Located near the entrance of the camp is Salvation Mountain, a large piece of folk art created by the late Leonard Knight, who amended a hillside with acrylic paint, concrete, adobe, and Biblical verse. In 2010 Westmorland had a reported population of 2,225. Its first post officed opened in 1909, when the town’s name was still spelled “Westmoreland.” It incorporated with that spelling in 1934 and then dropped the “e” in 1936. Winterhaven (formerly Karmack) is a CDP which in 2010 reported a population of 394 people. It is located partly on the Fort Yuma Indian Reservation. It’s home to historic Fort Yuma, built in 1851.